Petermann Glacier in northwestern Greenland is most famous for its dramatic calving events of 2010 and 2012, during which it lost nearly a third of its length. But since this glacier floats on the ocean, in fact it loses quite a lot of ice by melting into the ocean. We spent a month in the vicinity of the glacier in August 2015, but did not have much oceanography equipment. Yet using only temperature and salinity (and oxygen when the sensor worked), we calculate in this paper how much meltwater is in the fjord, how much leaves the fjord, and map where it goes. 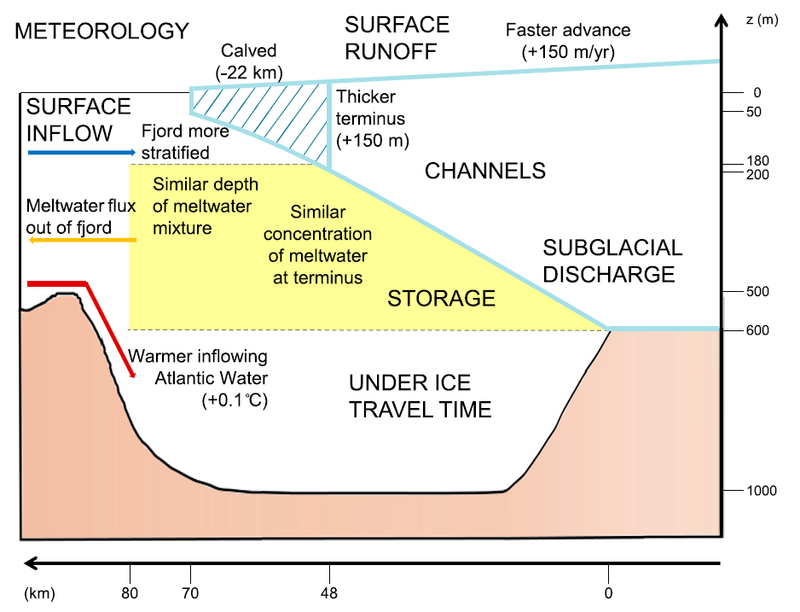 Schematic of what has changed in Petermann Fjord since the calvings of 2010 and 2012. Capital letters = probably important, but magnitude unknown to date. There is obviously a lot that we do not know then, and in particular we need to study how much this system varies from day to day to season to years. Funny enough, this is what my master student is doing right now!